Water. Don’t rely on the rain penetrating the lush canopy of leaves. It won’t. You need a handy watering can or hosepipe and you need to check your plants every day, come rain or shine. Soak your compost to ensure plants get rehydrated. They might not need watering every day but still check. Deadhead. A daily check also allows you to deadhead or nip off fading flowers. You see, all a plant wants to do is reproduce. That’s produce flowers, set seed and its job is done. You, however, just want the flowers. Taking off the blooms before they form seeds will encourage the plant to produce more flowers. Simple. Do this daily even multitasking with your watering can in one hand and your snippers in the other. Cut. Some bedding can get a bit lanky or leggy. This can happen when light has been low or plants are crammed in. Don’t be afraid to cut back plants to a few inches of the compost. I’m thinking about the foliage plants such as dichondra and ivy. They will soon re-shoot and produce great displays. Pinch. Fuchsia and pelargonium are both firm favourites in bedding plant displays across the country. Both will benefit from pinching out. All this is entails is nipping out the top two growing leaves, or the growing point of each shoot. This encourages side shoots further down the plant to grow and creates a bushier plant. It’s pruning without the secateurs as you can use your fingers. Plants that are too dry will struggle and ones sitting in pools of water merely show the incompetence of the retailer. Go for bargains - it’s late in the year for most bedding and plants should be reduced in price by now. If they aren’t, then ask. And plant them up as soon as you get home, water well, use a quality peat and green waste-free compost and check daily. Then you can rest easy under your new bedding safe in the knowledge that your plants are doing just fine. 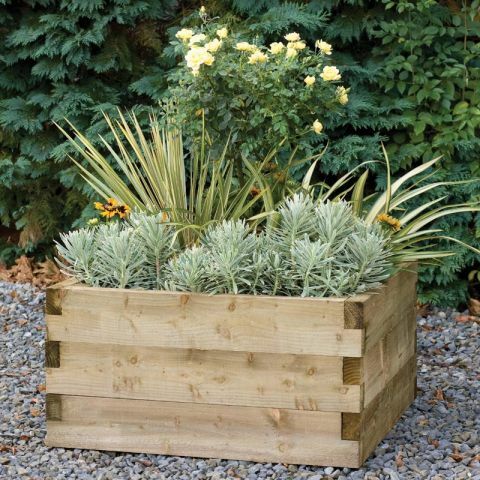 Remember, Buy Fencing Direct are the UK’s leading supplier of premium planters, so take a look at our superb range today and give your plants the wonderful home they so richly deserve.